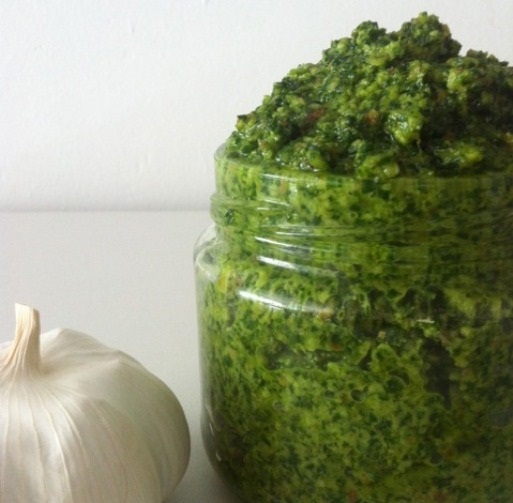 Try this healthy alternative to the traditional pesto - you'll be amazed! Place half the ingredients in the Boss and set to ‘chop’ for 1 minute, using blending wand to move ingredients into the centre. After 1 minute add in the remaining ingredients and process for a further 2 minutes, once again using the wand to move all ingredients together so a uniform consistency is created. Remove from blender and store in glass jars in the fridge with a drizzle of olive oil over the top to finish. Note This recipe was made using the Boss. By soaking your almonds for a few hours or overnight, a substance in the almonds, known as phytic acid, is released which blocks the uptake of many other nutrients. In addition the soaking process activates many of the wonderful nutrients in the almonds. + If you prefer your pesto with a slightly looser consistency add an extra ½ cup olive oil + Nutritional yeast is deactivated yeast, which is particularly rich in B vitamins. It has a nutty, cheesy flavor making it a great substitute for many dishes, such as parmesan or ricotta in a traditional pesto blend.. It's very yummy! I love it!! Proud mum? We love it too!